All children are sounders and movers, and their natural aptitude for music blossoms in a sufficiently rich music environment. When given a supportive music environment, children learn to sing and dance as naturally as they learn to walk and talk. How is this possible? Children learn differently than adults. They learn instinctively and constantly. They teach themselves through imitation and play, through being immersed in their environment, and through every interaction with adults and older children. A pioneer in early childhood music and movement education, Music Together facilitates joyfully sharing songs, rhymes, movement and instrument play for hundreds of thousands of families worldwide. Fully trained, registered Music Together teachers lead groups of 6-12 children and their parents or caregivers (nannies, babysitters, grandparents, or relatives) in 45 minute classes of music and movement experiences. Each weekly class offers a dozen songs and rhythmic rhymes, including fingerplays, small- and large-movement activities, and instrument play. The relaxed, playful, non-performance-oriented classroom setting respects and supports the unique learning styles, developmental levels, and temperaments of all participants, creating a strong sense of community. For more information, see our Curriculum page. Young children learn through play and experimentation, and by watching and listening to the grown-ups they love. Adults don't need to have music skills; they just need a desire to play and have fun with their children! 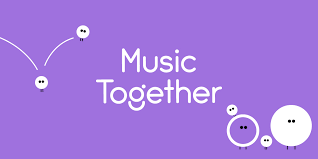 Learn more about the Music Together philosophy.